The event “Architecture for Humanity” was a largely successful even with overwhelming response from a variety of audiences. 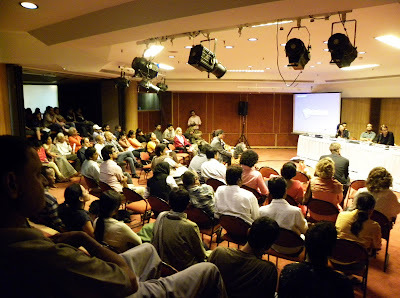 The event was opened on 26th October 2009 by The Deputy Ambassador for the Embassy of Netherlands in India and the Cultural counsel for the Embassy of Afghanistan in India. 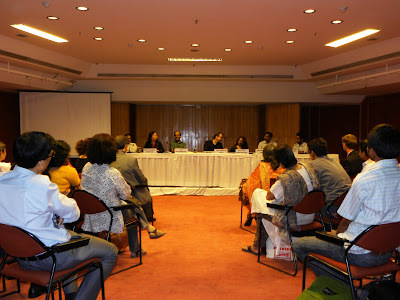 It was followed by the first panel discussion. This discussion focused on the “Humanity part of “Architecture for Humanity”. We discussed people and their habits, regions and their cultures, architects and their ideologies. Are copy pasted western models valid? Or can we find inspiration in a place and its culture for our art, craft and architecture. How can we truly involve people, the communities, in the design process, of a building which is completely for them? The most important point highlighted was the importance of maximum people participation in any design process. Whether it be Revathi Kamath’s effort to rehabilitate the slum at Shadipur depot or Inder Kochhar’s zero km. resort at Lakshmansagar. The process of architecture needs to be slow and participatory. The architect needs to sit down with all the stakeholders and try to understand their needs. At Shadipur, the Kamath’s did not bulldozer out the slum to give rehabilitated dwellings to the people, but instead opted for an “evolving home”. They sat down with the 350 odd families, to understand individual needs to give them a first home on the ground. At the same time they equipped them with the skills to build and evolve their house as the family and resources grow in the future. This participation need not be limited to buildings only. For example, SEWARA’s resort in Lakshmansagar uses only local labour and materials not only for the building, but also for the products inside the resort. The owner himself lived with local people and learnt their ways over a period of months, and then, only after gaining their confidence and understanding their crafts, did he begin the building process. Moe Chiba, the heritage specialist from UNESCO, presented a very valid point when she brought to the audiences notice the plight of the dying arts and crafts. These crafts should not replicated and put in the bracket of heritage, but should be given a contemporary interpretation if we are to save them. Ms. Moe Chiba also pointed out the role of dying urban open spaces which directly lead to the demise of local crafts. It is her viewpoint that it is only in these urban open spaces, the leftover spaces between the buildings, the land which has no ownership, which is a breeding ground of culture. In the end a short mention was also made of the role of the environment in building, by Mr. J.K.Dadoo, Ex Secretary, Environment, Delhi. He talked of a few simple things that we as architects or users can incorporate in our lifestyle, for healthier living, for example rainwater harvesting, switching to CFL’s, waste treatment, planting trees, etc. The audience showed some concern over things like, what trees to plant? And cost of installing a rainwater harvesting sytem being too high. They were informed of the native tree varieties which are fast growing and need no maintainance, and govt. subsidy programmes for harvesting systems.